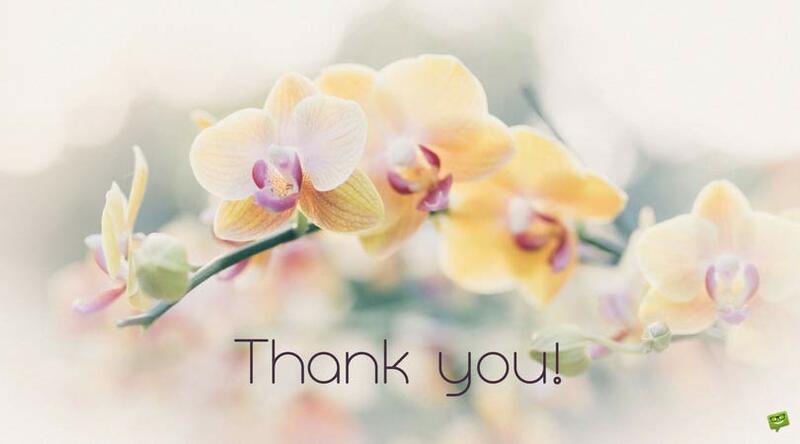 Thank you for your Birthday Wishes & For Being There! Thank you for your Birthday Wishes, your Presents & For Being There! 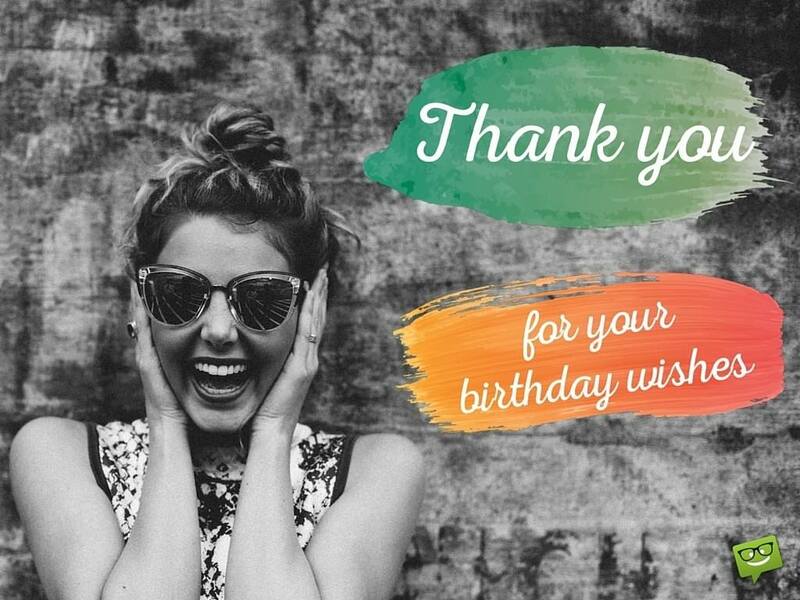 Saying thank you for the birthday wishes you received can be a tradition many people forget or choose to skip. Then again, getting a great birthday gift from someone special or even their attendance to your birthday party can bring you such joy that you would like to thank them afterwards. This year make the effort to let everyone who cares for you know how much you appreciate the wishes they kindly sent you, the gifts they bought you or them coming to your birthday gathering. Whether you want a custom message for each person, or you’re looking for a single idea to inspire your mass thank you campaign, we hope these great examples help you. Thank you so very much for the kind birthday wish you sent me. It really makes the day when everyone you care about sends you a lovely wish. Thank you dearly, and I very much look forward to seeing you again soon! 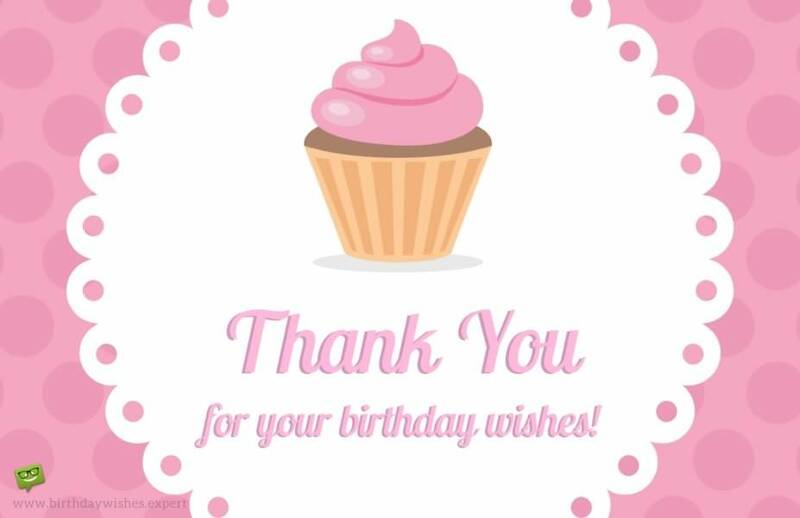 To everyone that left me a birthday wish on my page, thanks a million! You are the best collection of friends a person could hope for! Thank you! Your birthday wish was one of the kindest and sweetest I received on the day. Thank you so much and bless you for sending it to me, it really made my day. Thank you for your warm and heart-felt birthday wishes. I really appreciate the birthday wishes you sent me, you can always tell who your closest friends are by those that make the effort. So I want to make the effort to return the favor. Thank you so much again! This year I had one of the very best birthdays of my life. 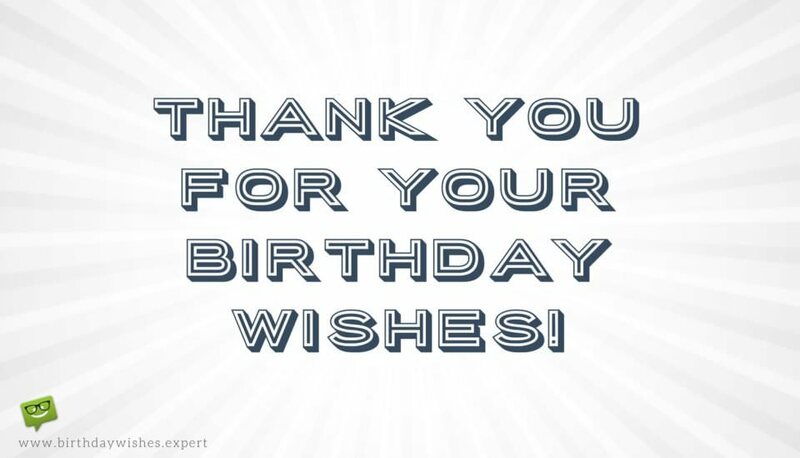 Everyone who contacted me with a birthday wish played a huge part in making my day extra special. Thank you so much and all my love! You guys are there for me when I’m down, but also you’re there for me when we need to blow things up for my birthday! The truth is I can’t thank you enough, but I am going to try anyway. 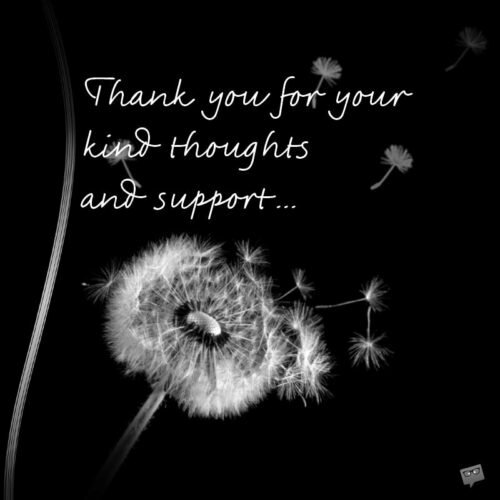 Thank you so much my dearest friends, I owe you all so very much. I was away from home this year for my birthday, but I want to thank everyone who contacted me with a fantastic birthday wish! You brought a little piece of home to me! Thank you all so much! Thank you for those wonderful birthday wishes that you sent my way. It really means a lot to me that you not only remembered my birthday but also took some time to send me those beautiful wishes. Thanks once again. 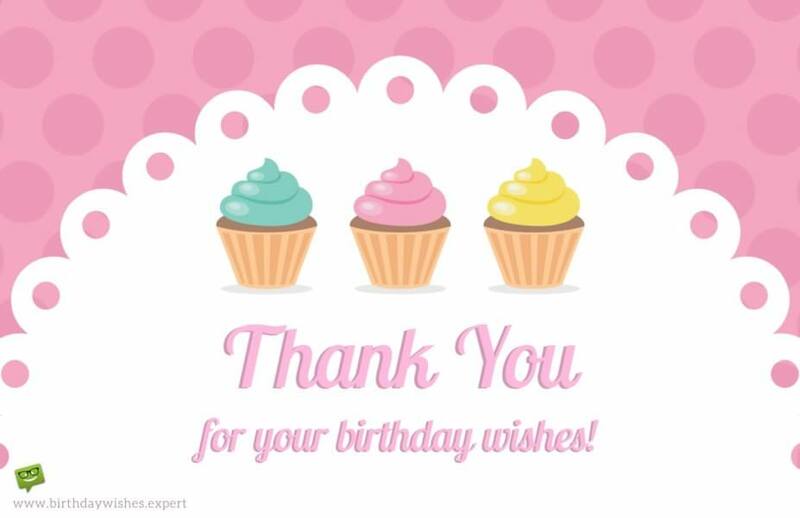 I appreciate those lovely birthday wishes that you sent to me on my birthday. Thank you so much for taking the time out of your busy schedule to do that. 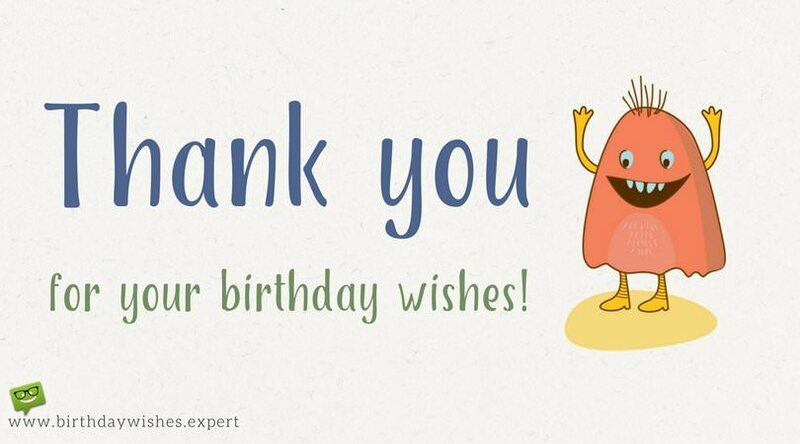 Thanks for making my birthday the more special with those amazing warm wishes. God bless you. A number of things made my birthday celebration wonderful, one of such things was the sweet birthday message you sent me. Hearing those words from you really made me feel so special. Thank you. Thank you for the extraordinary love and support you showed me on my birthday. I appreciate it from the bottom of my heart. You are one of the special people in my life, which is why it felt so great receiving your warm wishes on my birthday. Thanks very much. The wishes you sent me on my birthday meant more to me than you’d ever know. And for that, I just want to say a big thank you. Those were some astonishingly beautiful birthday wishes you sent me on my special day. Thank you so much, buddy. Those amazing birthday wishes from you really went a long way in putting a big smile on my face. I really do appreciate the gesture. Thanks. 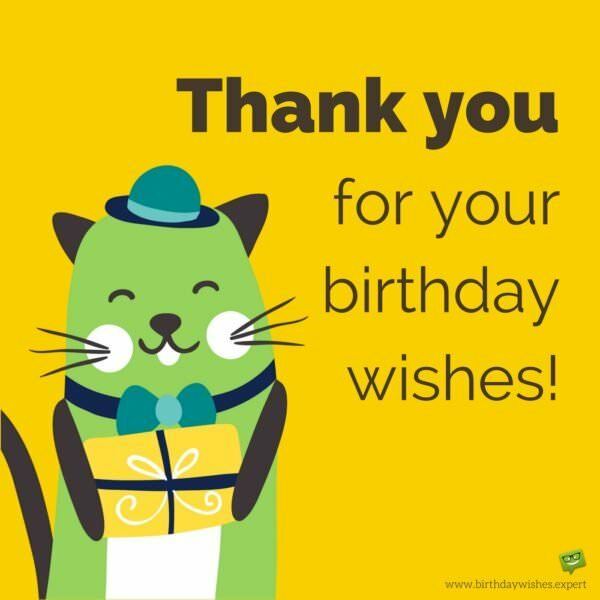 My lovely family always makes the most effort to share the very best birthday wishes, I want to say a huge thank you to you for the birthday wish you so kindly sent me. My day was a brilliant one thanks to greatest family a person could wish for. Thank you so much! Can’t wait to see you all again soon! 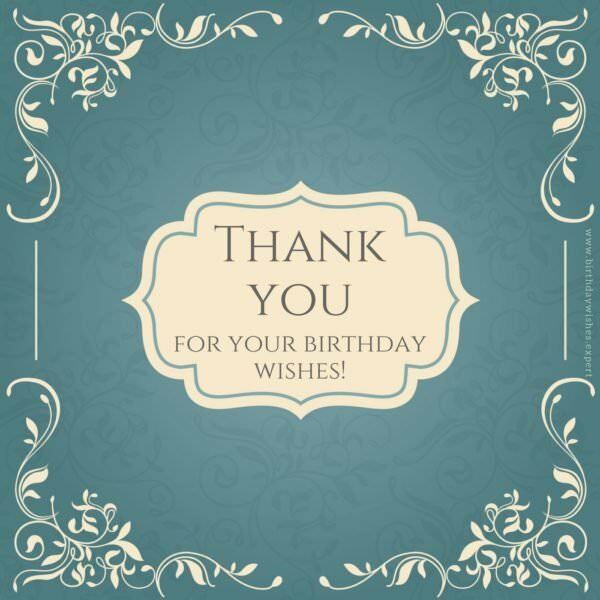 Thank you so much for your generous birthday wish on my birthday! I can’t thank you enough! This year was really one to remember for me, and I have you to thank for contributing to that. Thank you so much and all the very best! There are no words that express how important you were to me on my birthday! Thank you so much for all you did and making my day so perfect! 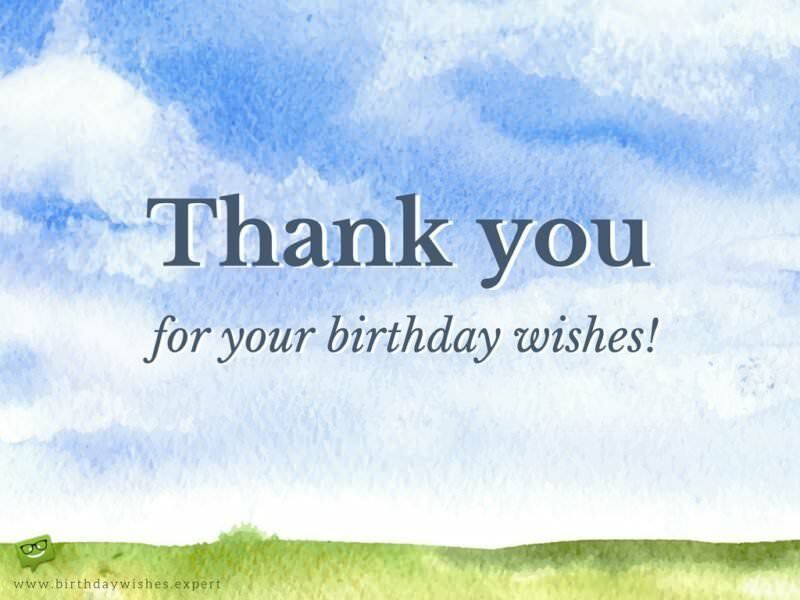 Thank you for your birthday wishes. Sometimes a thank you is not enough, but until I think of a way to fully make it up to you, this will have to do! Thank you so much for all your very kind efforts on my birthday. It really was a special one thanks to you! 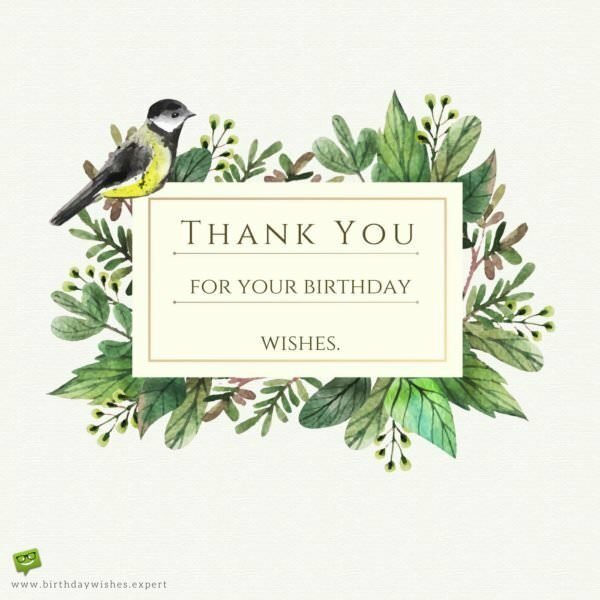 As we get older, our birthdays tend to attract less attention from our loved ones, so I just wanted to thank you for remembering me on that very special day of mine and sending me those sweet wishes. Those superb birthday wishes from you made my birthday celebration very exciting and memorable. Thank you for all the love you showed me. You guys really rock! 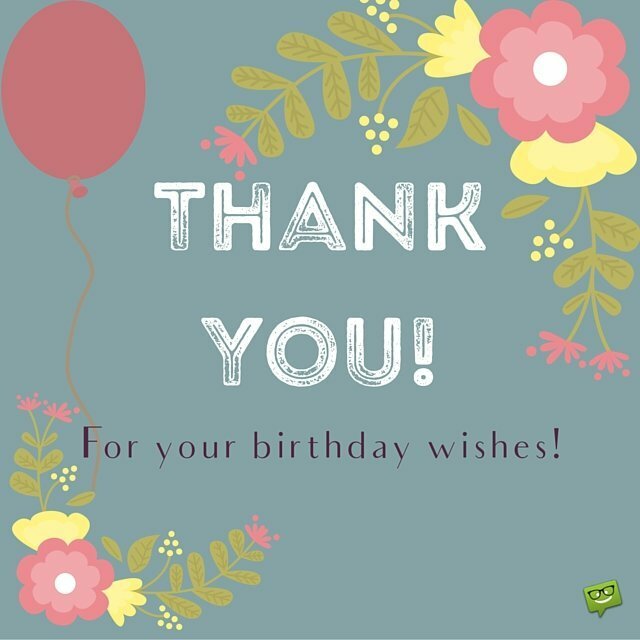 I want to say a big thank you to everyone who took time out of their busy lives to send me those astonishing birthday wishes. I am truly blessed to have such wonderful people in my life. Thanks once again. Thanks for those heavenly wishes on my birthday. Friends like you can indeed be hard to find, which is why I’ll always cherish our friendship. God bless you. Your beautiful wishes on my birthday filled my heart with such happiness no gift could ever give me. Thank you for such a priceless gesture, which I will never forget. My birthday would have never been complete without those heartfelt wishes that you sent me. Thank you for making my birthday super awesome. Your wishes were the best gift I received on my birthday. Sometimes I wonder what I would do without someone like you in my life! I say a big thank you to you from the depths of my heart. This is to everyone who not only remembered my birthday but went ahead to take the extra effort of sending me warm wishes. I really appreciate you guys in my life. I will forever cherish those beautiful birthday wishes that I received from you. They were so beautiful and touching. I was forced to fight back the tears upon reading the beautiful wishes you sent. That was so sweet and thoughtful of you. And do know that I will forever treasure those beautiful words of yours. Thank you so much for completing my birthday. 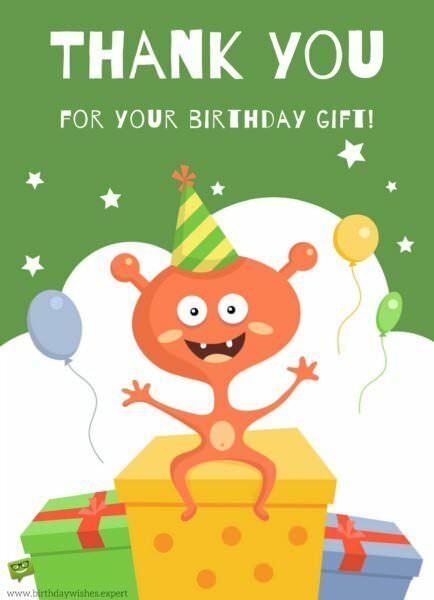 On my birthday, I received so many gifts, but none of them compares in value to the awesome birthday wish that you sent me. Thank you for making my birthday a very memorable one. The most precious gift that I received on my birthday was that lovely message I received from you. It truly meant a lot to me, and I know it is going to linger in my heart for a very long time. You’re such a wonderful friend. Despite how busy your life tends to be, you not only remembered my birthday but also made out time to send me such beautiful birthday wishes. You really made me feel special and I want to thank you from the bottom of my heart for that sweet gesture. 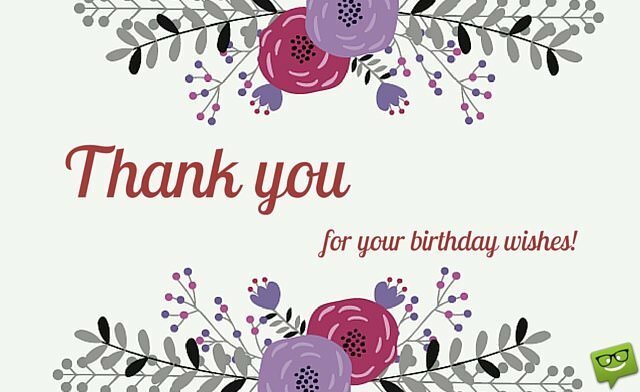 Thank you for remembering my birthday and sending me those memorable birthday wishes. Every blessed day you prove to me again and again that you are a true friend. I’m blessed to have someone like you in my life. Your heartfelt wishes added so much color to my birthday celebration. I just want you to know how much those words from you meant to me and how much I appreciate that beautiful gesture from you. Thank you, buddy. I never thought words could make me feel so happy and special until I read those beautiful birthday wishes you sent to me. Your words were so moving they literally brought me to tears. Thank you very much! Only my true friends remembered my birthday since I didn’t disclose that on social media. And you, my friend, prove to me that you are a true friend by remembering my birthday and sending me such wonderful wishes. Thank you, my dearest friend. To some, they might just be ordinary words. But to me, they meant more than that. Thanks for the priceless birthday wishes you sent me on my birthday. Those wishes not only made my birthday worth celebrating but they also made me feel very special. I want to thank all my friends and family for those wonderful birthday messages, some of which almost brought me to tears. Thank you all for showing me with such amount of love and making my birthday an event to remember for years to come. I love you all from the bottom of my heart. I just wanted to thank you for those kind words on my birthday and let you know how blessed I feel to have such a wonderful person like you in my life. You really made my special day extra special. Thanks. I will always keep those touching birthday wishes you sent close to my heart, for I consider them to be priceless. Thanks a lot. You’re such a special person to me. My gifts this year were beautiful. I want to thank you ever so much much for the fantastic present you kindly gave me! I can’t wait to return the favour for yours! Some people gave me money, and some people just sent me messages. You sent me a gift and for that I have to say I love you more than any of them! Thank you so much! It’s perfect and is exactly what I wanted. Some people think too many presents on your birthday can spoil a person. To those people I say they are just simply jealous! Thank you so much for the gift and for helping to make my birthday a brilliant one! If I had to rank the best gifts I received for my birthday, yours would certainly be within the top 3! That’s amazing seeing as I got nearly 50 in total! That’s right I counted. Congratulations on being amongst the very best! Thank you so very much! Thank you for your birthday gift! Many people think size matters when it comes to gifts. I don’t. Though the gift you so thoughtfully found for me was smaller than most, it was certainly one of the biggest surprises of my day and I want to thank you so much for it. I love it! If there was an award for being able to pick the perfect gift you would win it every year. This year you outdid yourself and deserve a lifetime achievement award for it! I love you and thank you so much for this present, it really did make my day perfect! Your gift means so much to me. Thanks, a lot! You made me feel so special, and that is a remarkable birthday gift. Thank you so much. It was an absolute pleasure seeing you at my birthday party, I was thrilled that you were able to come! Thank You. 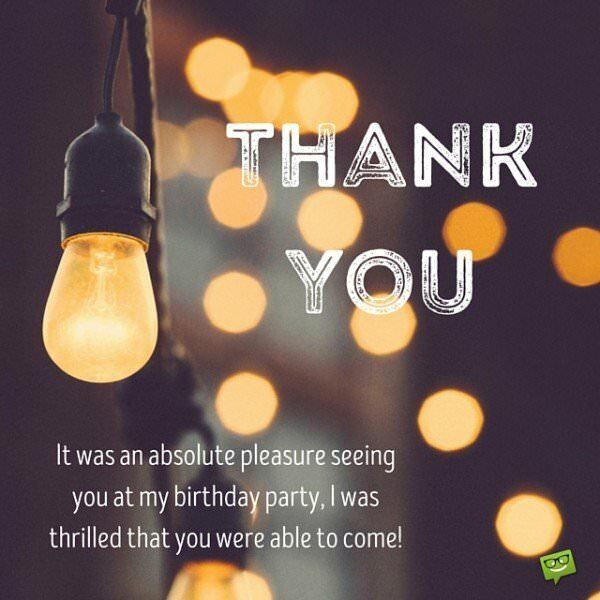 I am over the moon that you were able to come to my birthday party! I want to thank you for attending and very much hope you had a fantastic time! The night was made perfect because you along with all of my closest friends and family could come. Thank you so much again! You didn’t just turn up, you arrived in style, helped around the place and kept things alive! You helped make my birthday party a success and I want to give you a huge thank you for coming! You’re the best! It was an absolute pleasure seeing you at my birthday party, I was thrilled that you were able to come! It’s been so long that I forgot how fun it was hanging out! I really hope you had a great time! I look forward to seeing you again soon! It’s true, the party may have not been as full as we hoped, but I like to think that quality is more important than quantity. The most important people were there including you, and that is all that I could hope for. Thank you! We have this party every year for my birthday but this year was one of the best! You and the guys really helped make that happen for me! Thank you so much! Let’s do even better next year! Your presence at the party means more than a million dollars to me! Thank you so much for coming. Because of your great input, my party was more fun than anyone imagined. 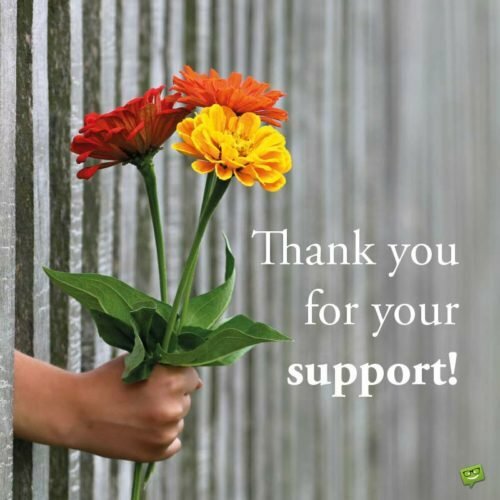 From the depth of my heart, I want to say Thank You!